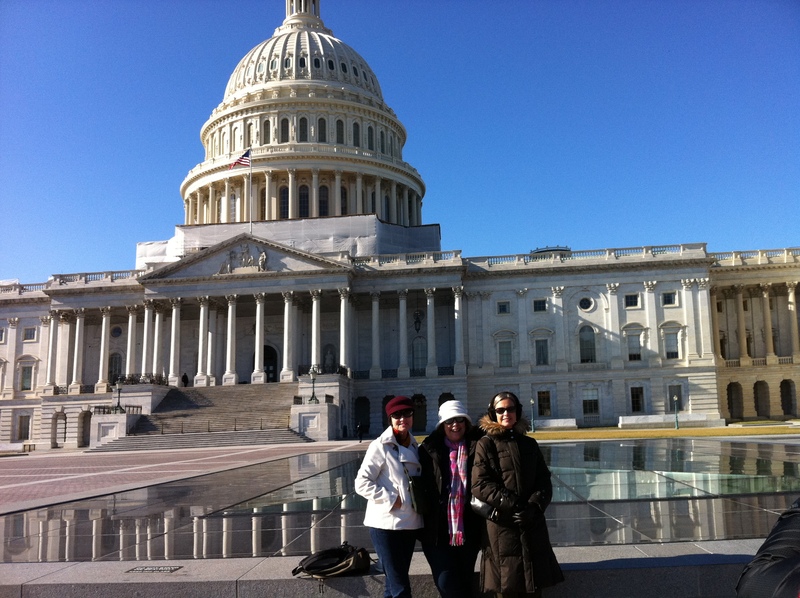 After breakfasting on lox and bagels and omelets, we once again headed out into the capital city to do the tourist thing. 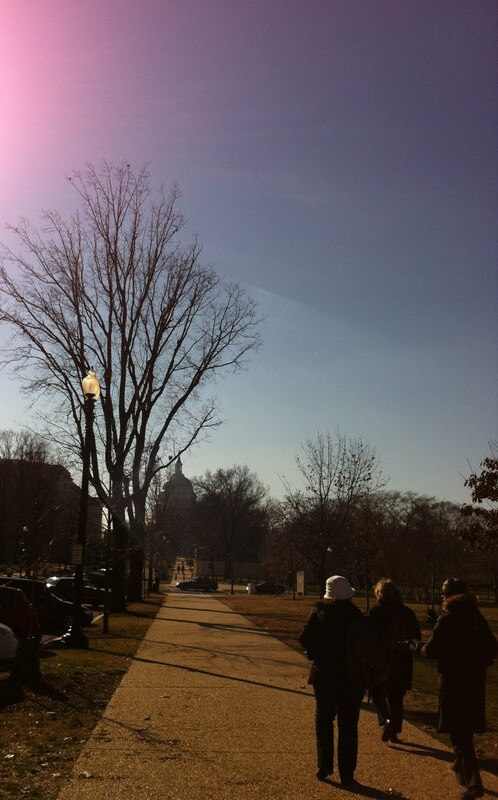 Destination: the Capitol. Its shiny dome had been tempting and taunting us from the moment we had arrived in the city two days earlier, and now we were actually going to get to see it up close and personal. 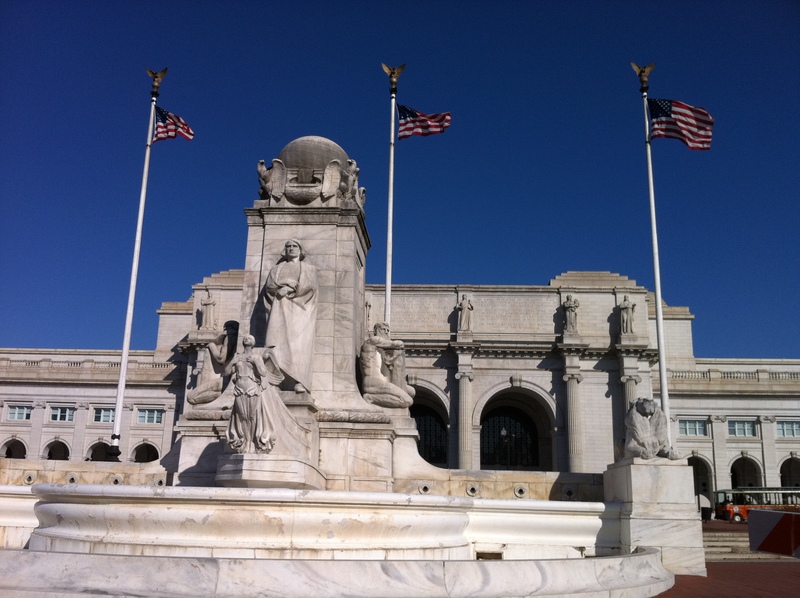 First, however, we rode the metro to Union Station. Too early for the shops to be open, the station was relatively quiet. Looking at its breathtakingly beautiful architecture brought back memories of an earlier visit with my son and some friends when we had taken Amtrak from Florence, SC. Like millions of other visitors, we took walked out of the front door and were impressed with the statue of Christopher Columbus. As we busily snapped a few pictures of the man who sailed the ocean blue in 1492, we kept glancing up the hill at the Capitol. Then we began our ascent, all the while talking about the scenery around us. There at last, we were stopped by security guards who told us that the building was closed but that we could visit it at 8:30 the next morning. Happy to be so close, we couldn’t leave without taking several photographs. The one of the four of us standing against the wall was snapped by a man who jokingly told us that he was going to charge us. After all, he had six children to educate and every little bit helped. I hope he and his family enjoyed their time on “the hill” as much as we did. Next stop, the Smithsonian. We began our museum visits with a trip to the American Indian Museum where we were treated to a performance of traditional dances. After about an hour of trying to read and study all of the exhibits, we hustled towards the next stop. My chums went to the American Museum of Natural History while I spent an hour or so walking around in a trance in the National Gallery of Art. Among other things, they wanted to see the Hope diamond, and I wanted to see art, art, and more art. It’s huge! I was awed by its size and the collections. I was drooling over a poster by Georgia O’Keefe when my friends called to say they were headed to the Museum of American History. I left Georgia’s poster and walked to the next museum to join my friends. In need of some energy, we ate snacks in the cafeteria before viewing the exhibits. Of my recollections of the afternoon, those moments in the cafeteria are among the finest. Here we were eating our yogurt and salads among some of the most diverse people we’d dined with in a long time, all the while looking out of the big glass windows at the sidewalk and the passers-by. It was marvelous. Fortified and refreshed, we went upstairs to view the exhibits of America’s past. LOVED THIS! 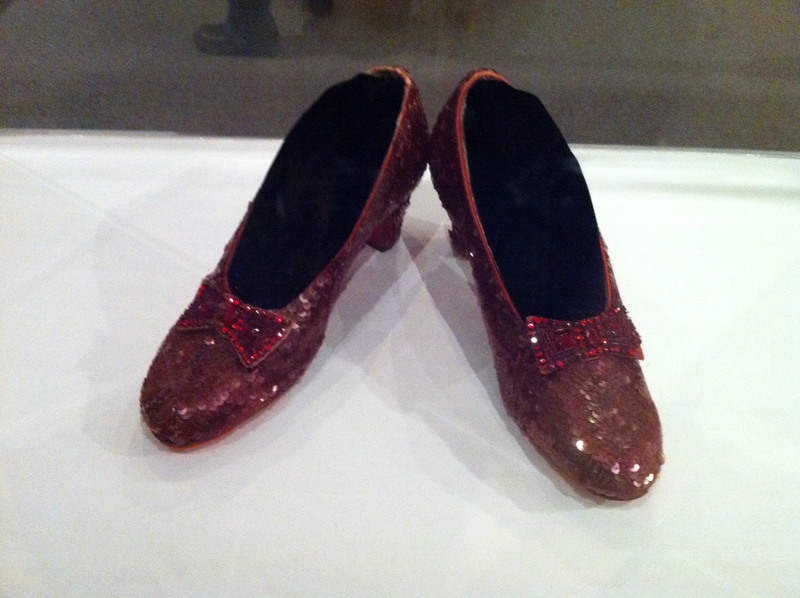 From Dorothy’s red slippers to model train stations, we reveled in all of it. 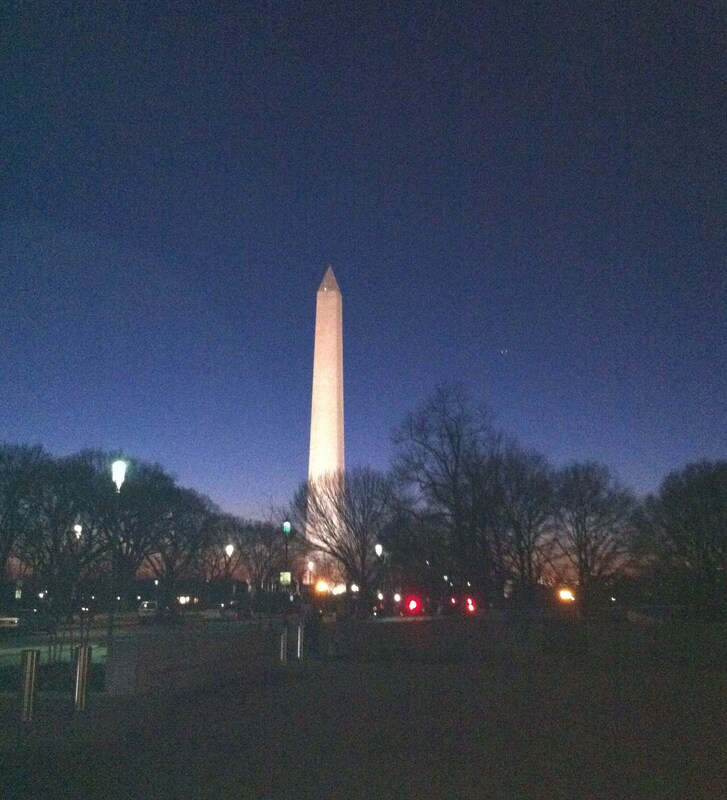 We left the last of the museums at dusk, and as we scurried across the mall in search of the metro, I took a photo of the Washington Monument. Had to. There was something about its tall simple beauty that spoke to me. Weary but happy, we decided to grab some sandwiches at Subway in Chinatown and take them to the room. So much for our vow to eat ethnic food every night! At least the Subway was in Chinatown even if the food wasn’t noodles or bok choy! Lights were out by 11:00. 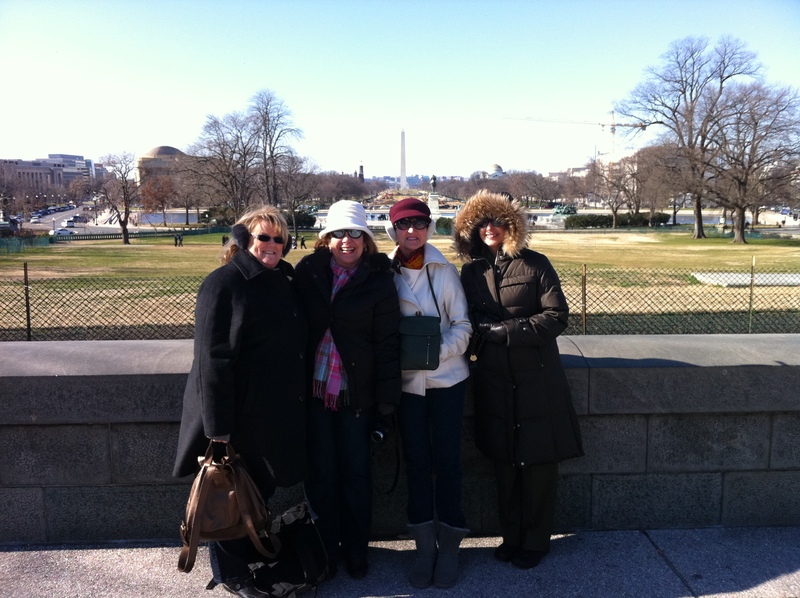 These Southern gals needed a good night’s sleep for touring the Capitol and the Library of Congress the next day. You know, what I remember best from that day, was the exhibit at the Smithsonian of all of the First Ladies Dresses! I am still talking about it! I loved that ! This series is so beautiful!!! I wonder if I can get it to print out, I would like to put it in my scrapbook! I enjoyed that too. This morning I'm rememembering one dress in particular that really "impressed" you! Next Next post: Is It Already Monday? ?